This textbook companion website has a page for each chapter in the text containing the links for URLs listed in the book, information on emerging trends, additional examples, corrections, and review activities. Review flash card activities are available for each chapter on this website. Students can use these activities to review concepts and terms. Some instructors use these as group activities in the classroom. They also can be made available for independent student self-assessment activities. ★ ★ ★ ★ ★ Excellent! Covers HTML5 & CSS3 the right way! 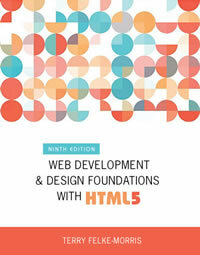 Felke-Morris does an outstanding job of covering the foundations of HTML5 and CSS3 in this 6th edition. Each chapter has Hands-on-Practice exercises with step by step instructions and clear visuals that capture the result of the code. Solutions to the practice exercises are provided in the student data files so that learners can compare their work to the correct solution. There are also end of chapter exercises and four different case studies that build across all chapters, with solutions available only to instructors. There are complete instructor materials available on the publisher's website including test banks, end-of-chapter and case study solution files, PowerPoints, example syllabus, and instructor manuals. In addition, there is a superb, open-access companion website developed by the author with tons of supplementary resources, flash cards, and chapter updates for any errata discovered after publication (webdevfoundations.net). I've adopted this book for a college level introductory web development course after reviewing at least a dozen textbooks from academic publishers. The book is appropriate for beginners as well as those who are already familiar with web development and want to learn more about CSS layout and the differences between XHTML and HTML5/CSS3. 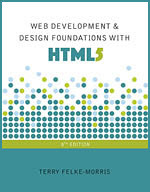 What sets this book apart from the rest of the pack is that it covers the material based on current specifications and trends, separating HTML structure from CSS layout and styles. The vast majority of books published by academic publishers are just using small incremental updates to previous editions, still use HTML tables for layout and menus, teach depreciated elements, and contain downright ugly or broken CSS for chapter exercises. Believe me, I know - I've spent countless hours reviewing them all very thoroughly and most are a waste of time and effort. I can't praise this book enough - it is clearly best of breed. We are currently using the book in five sections of an intro web development course designed for non-technical university students and they are succeeding. Consider it classroom tested. ... Great book! Downloads are available to instructors with exercise solutions, case solutions, PowerPoint presentations, and sample test questions. Contact your Pearson Higher Ed Addison-Wesley representative or visit Pearson Higher Ed Addison-Wesley Publishing for more information.